Almoez Ali scored with a spectacular overhead kick for a record ninth goal of the Asian Cup to set Qatar on their way to a first continental title with a stunning 3-1 win over four-times champions Japan on Friday (Feb 1). Sudan-born Ali's record goal came after a protest by the host United Emirates FA into his eligibility to represent Qatar was dismissed by the Asian Football Confederation only a few hours before kickoff. 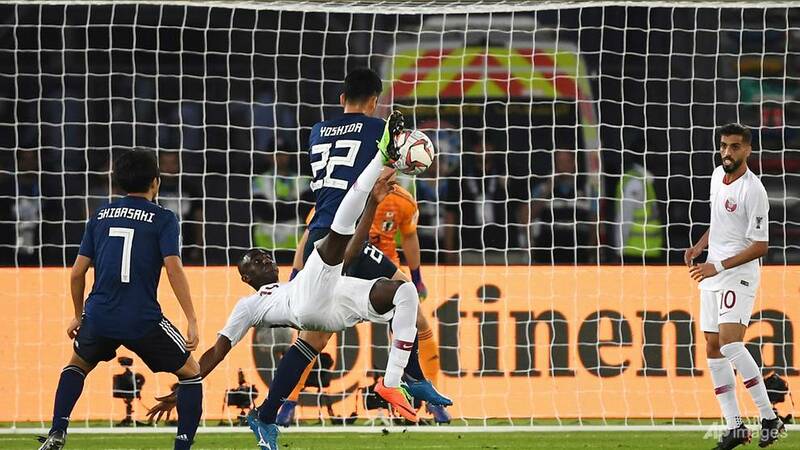 Japan finally found a way through a Qatar defence that had not conceded in six previous matches when Takumi Minamino scored in the 69th minute but the penalty condemned the Samurai Blue to their first defeat in an Asian Cup final. Japan, chasing a record-extending fifth title, started the brighter but it was the Qataris who drew first blood through the prolific Ali, who was later named Player of the Tournament. Afif has set up most of Ali's goals in the UAE and he was again the provider in the 12th minute with a cross that found the striker in space with his back to goal close to the penalty spot. There was still plenty of work to do but Ali took a touch off each foot to tee up the ball before angling it past Shuichi Gonda into the corner of the net with a bicycle kick. The Afif-Ali combination nearly struck again a minute later but the Qataris did not have to wait long to double their lead. Hatem, who scored the winner against South Korea in the quarter-finals, summoned up another magnificent strike, cutting in from the right before curling the ball past the helpless Gonda into the top left-hand corner. The Japanese, who had weathered a first-half storm before beating Iran in the semi-finals, kept their composure but were simply unable to break through the compact lines of Qatar's defence. Japan skipper Maya Yoshida clashed heads with Boualem Khoukhi on the hour mark resulting in the big Qatari defender being carried off on a stretcher. The Qatar defence looked less assured without him and Japan took full advantage when Yuya Osako played in Minamino and the winger chipped the ball over advancing goalkeeper Saad Al Sheeb. Japan poured forward looking for an equaliser but, after reference to VAR, Yoshida was adjudged to have blocked Abdelkarim Hassan's header with his hand in the 80th minute and Afif calmly sent Gonda the wrong way from the spot.